Situated on the first floor, this department has 34 beds distributed on first-class and second-class rooms and suites. It also contains an intensive surveillance service. The Internal Medicine department receives all pathological cases of patients aged 16 and above, from all health insurance parties, which do not require surgery. In case a need for a surgical intervention occurs, the patient is transferred to the Surgery Department. Situated on the second floor, it has 34 beds. 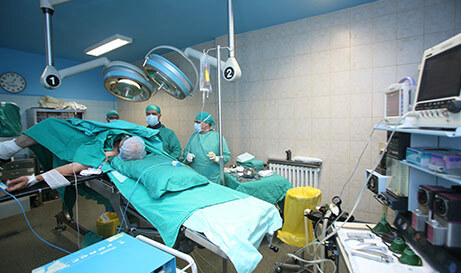 In this department all types of surgeries are performed (Laser surgery, laparoscopic surgery and others, in addition to the traditional surgery), with the exception of open-heart surgery (check Cardiology Department). The surgical interventions take place all week long, from Monday to Saturday, from 7:30 a.m. until the end of appointments. The Surgery Unit is situated on the first basement, and it contains three Surgery Rooms, one Preparation room and one Resuscitation room. 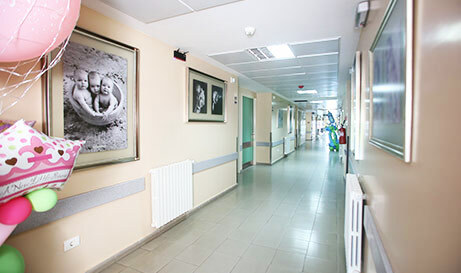 The pediatric department is situated on the second floor, and it has 12 beds. 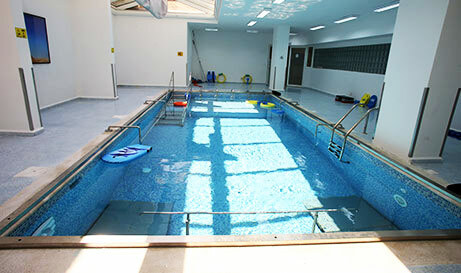 It includes an Isolation room, a Play room and a Preparation room. This department receives children aged between three months and 16 years. 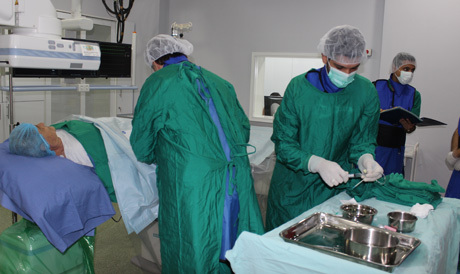 The Cardiac Catheterization Department was opened in June 2016, supervised by cardiologist Dr. Marwan Chalah, in collaboration with a group of medical specialists, and includes the latest equipment and techniques. 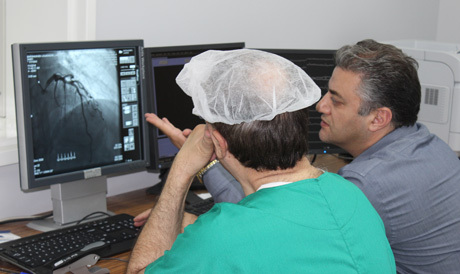 The Department contains non-invasive cardiology “Cardiologie non invasive” including the “Holter”, which is 24 hour ECG, the “Stress Test” which is testing the cardiac effort, and cardiac ultrasound, which is all kinds of cardiac ultrasounds. 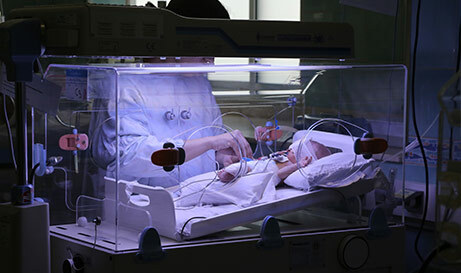 It also contains invasive operations for all the arteries of the body (heart and peripheral arteries), a Children’s Department, and the implantation of all kinds of artificial cardiac pacemakers. Moreover, the department features a cardiologist who provides patient care on a round-the-clock basis. Situated on the third floor, it has 12 beds distributed on first-class rooms, second-class rooms and suites. 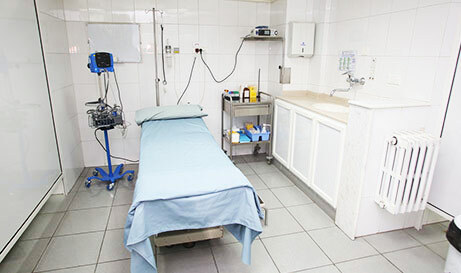 The department contains a preparation room, two delivery rooms, one labour ward and one monitoring & surveillance room. Regional anesthetics (Epidurals) are performed in the department, and when a Caesarean section is needed, the patient is transferred to the Surgery Department. 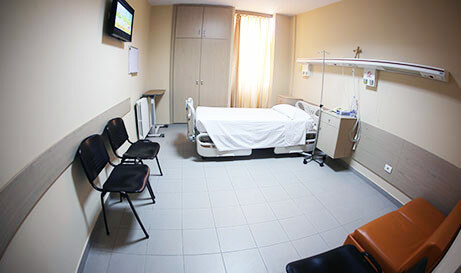 This department is located on the second underground level, and it has 13 beds, with an isolation room. It is open for patients daily except Sundays, between 7 a.m and 5 p.m. The dialysis sessions are supervised by a specialist physician, assisted by a nursing team. In case of emergency, patients are admitted in ICU for a renal dialysis session. 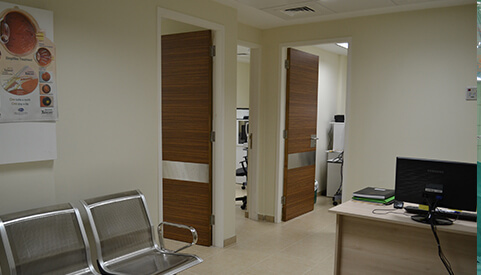 Located on the second floor, this department is related to the Surgery Department. It provides the diagnosis, treatment and surgical intervention for the urinary system. A Lithotripsy machine, to treat Nephrolithiasis (Kidney stones) without any need for anesthesia and without exposing the patient to any radiation. 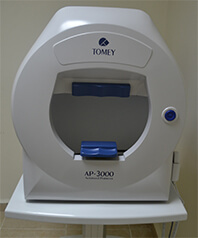 The advantage of this machine is that it allows the doctor to track the kidney stones in case they move due to the excessive movement of the patient during the session. 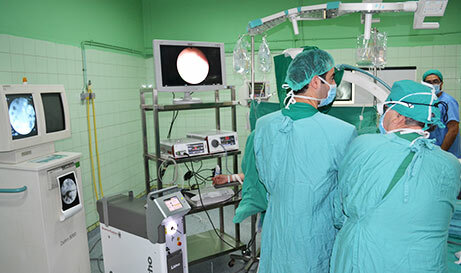 The latest Holmium Yag Laser Nephrolithiasis treatment technology. The cutting-edge speculum Flexible Ureteroscopy: Cobra Vision featuring high quality image transmission, with the possibility to stabilize and adjust the laser lines. The Flexible Cystoscope which allows cystoscopy without the need for any general or partial anesthetic. The high quality endoscopic technique Smart HD Visualization chain. The Ultrathin Ureteroscope, a very fine speculum, used to treat kidney stones in kids and adults. The Mini Nephroscope, for large-sized kidney stones. The Cyber TM – Thulium Laser, a treatment laser for prostate and to eradicate tumors in lower urinary tract and partial resection of the kidney. One of its most important features is that it allows the treatment of oversized prostate; it is safe for heart patients and allows the patient to return quickly to his normal life. Situated on the first floor, it has 5 beds and one preparation room. This unit provides all kinds of chemotherapy treatments from Monday to Saturday. 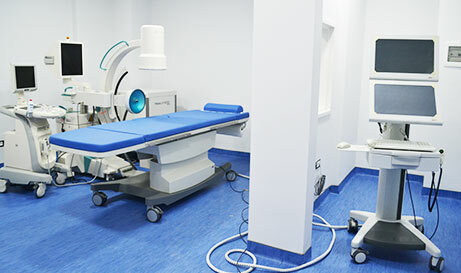 Situated on the second underground level, this center is equipped with the cutting-edge technologies and it provides the best services to the patients. 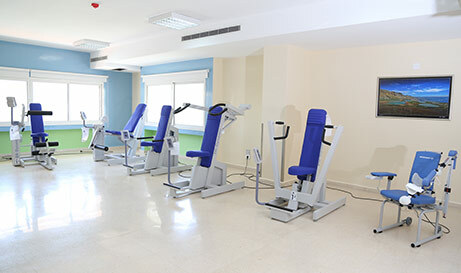 A scoliosis treating center providing the latest treatment technologies such as Hydrotherapy and the world-class Huber machine. Hydrotherapy for Lower-Back pain with the possibility for the patients of a monthly subscription giving them access to the special pool directly supervised by physiotherapists. 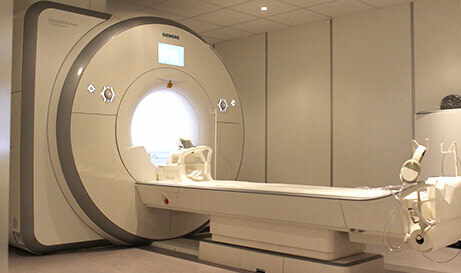 A Speech therapy service, with a special isolation room for Audiogram- Tympanogram. 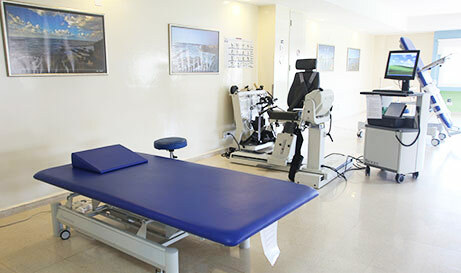 The Department of Palliative Care and Rehabilitation is one of the most important and sophisticated departments in the north region, as it is equipped with modern technologies and equipment to help the patient to relax and rest.It aims at providing patients with comfort, and in particular satisfying their basic needs, seeking their involvement in the community and helping them regain their independence and leave the department in the best possible condition. 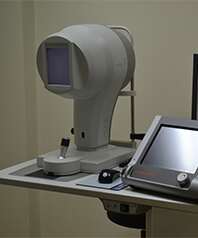 Located on the ground floor, this center is one of the cutting-edge centers capable of issuing sophisticated diagnostic reports for patients by detecting the unique characteristics of the eyes from different perspectives and with high accuracy, in order to give the patient an appropriate detailed prescription. 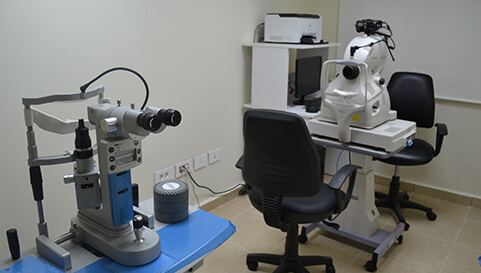 The importance of the eye center resides in the possibility of keeping a detailed electronic file for the patient and issuing an accurate report on the status of his eyes and his overall health situation, which allows the tracking of any eventual change in the future. 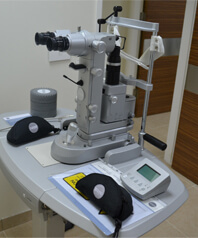 Through the diagnostic tests to the eye performed in the center, it can be possible to detect many diseases that threaten eyesight, and thus elaborate a primary diagnosis that allows the doctor to take preventive measures or to resort to surgical intervention. This department is considered to be one of the most important units of the hospital, in consideration to the modern techniques applied and to its state-of-the-art medical equipment. 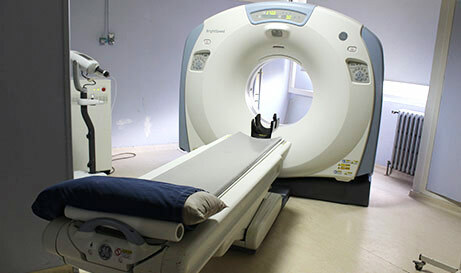 It also relies on digital radiology and imaging, which makes it easier for physicians to reach the accurate and precise diagnosis, enabling them to administer the right treatment in the appropriate and comfortable conditions. This medical imaging center is a Certified Center of the Lebanese Ministry of Health for the mammography campaigns within the annual national campaign to reduce and eliminate breast cancer. This service is situated on the third floor, and it has 12 beds, dedicated for patients who have minor surgery procedures or other medical treatments that do not require an overnight hospital stay. 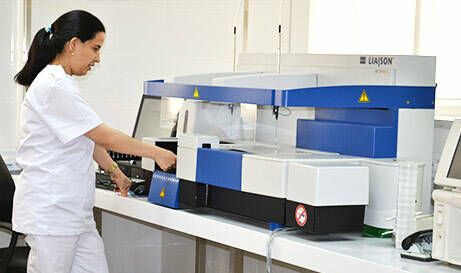 Located on the ground floor, this department confers the utmost importance to the accuracy and speed of the tests, always working on the modernization of the machines and medical equipment, while keeping up with the continuous medical evolution. 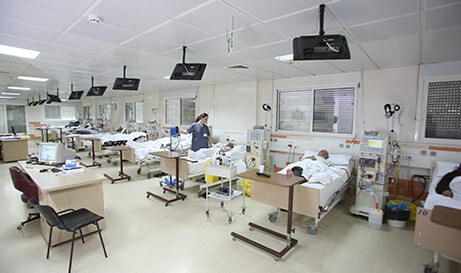 It is located on the first basement and it has 7 beds, a resuscitation room, a surgery room, a Gypsum unit, and an isolation room for infectious diseases. 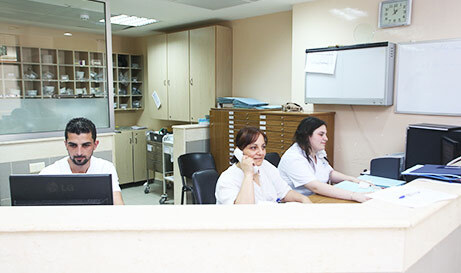 This unit provides all medical and surgical interventions without exception, 24/7.